One often yearns for good purist food in this era of food fusions, celebrity chefs and culinary thingamajigs. To please local palates or to impress a bunch of instagrammers, restaurants often modify traditional recipes resulting in "fun but not really genuine" grub. 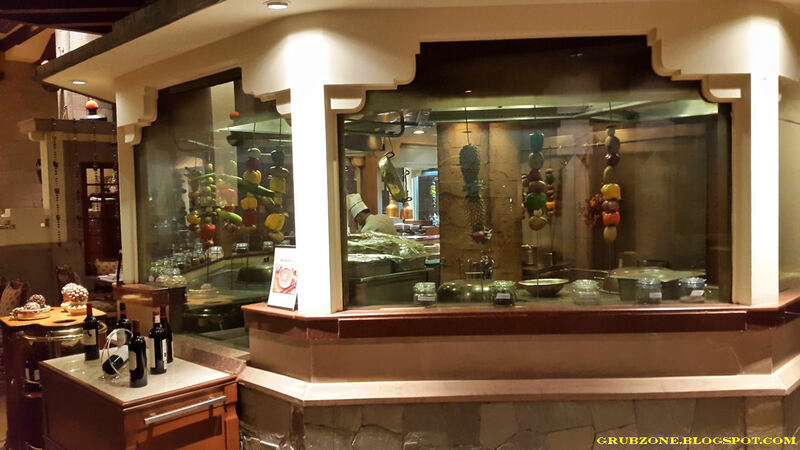 Kebabs & Kurries in ITC Grand Central has weathered this trend and serves North Indian food as its meant to be. Chef Farooqui may not be as famous as Gordon Ramsay but he is a master of the Lucknowi or the Awadhi way of cooking. Awadhi cuisine for ages has satiated the taste buds of aristocrats and royalty. Very few chefs are still armed with these traditional methods as younger and newer chefs embrace fusion and modern methods of cooking. Chef Farooqui has trained his team and his able first mate Sous Chef Patrick Braggs in the art of creating Awadhi culinary treasures. Modern methods have their advantages but Traditional methods are the only route to eat traditional food as its meant to be. Your idea of North Indian food may completely change after you have a meal here. Come to Kebab & Kurries to get acquainted with real Awadhi food. The place is a Golden lit fine dine with different areas given different themes. The kitchen is visible to the patron and one can see how their food is actually made. 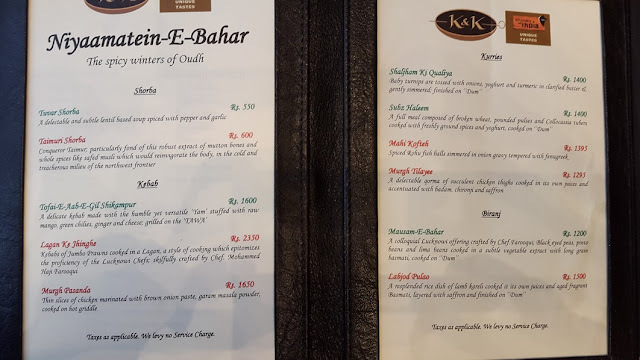 I was here to specifically try the Niyaamatein-E-Bahar menu. This was a Winter themed menu that stays till the end of January 2017. The menu revolved around the philosophy of serving food that makes one feel warm inside rather than feel the heat on the tongue. Its a marriage of spice and the internal properties of ingredients. Chef Farooqui abhors the idea of sprinkling hot spices on top of completed dishes, a practice that is employed in mediocre places. He believes in integrating spices at the right place at the right time. This not only amplifies flavor but it gives an eating experience like none other. 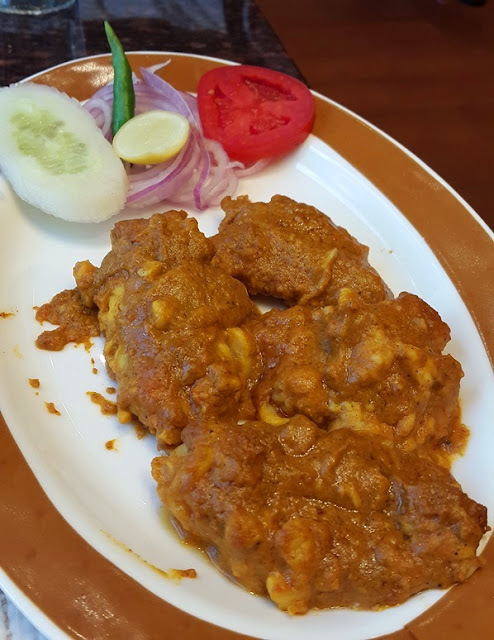 Regardless of where you have eaten North Indian food before - Your idea about it is incomplete until you try the food at K&K. I flagged my meal off with the Restaurant's customary welcome drink. This watermelon and spice filled drink was a refreshing appetizer. The Kebab in the forefront is Murgh Pasanda, a kebab version of a famed curry. Thin chicken strips were marinated with onion and spices which resulted in a powerful flavor. 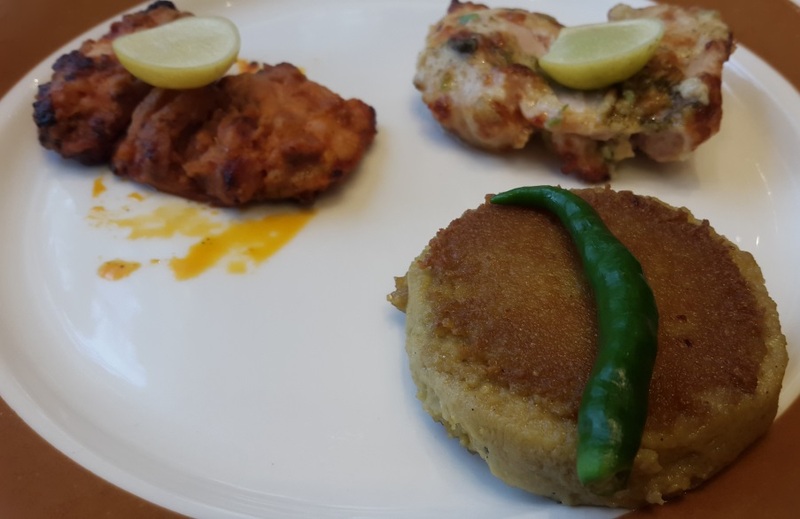 Initially it felt creamy like Malai Kebabs but the spice kicks in when you start to swallow. So the heat actually is felt beyond one's mouth. Cooking is an art and cooking is a science. Yet it continues to produce miracles which I cannot fathom. Shaped like a disc is the Tofai e Aab E Gil Shikampur. That is a big Urdu name with possible some Persian thrown in. Its a kebab made out of minced yam with a variety of flavors. The texture was rough but the kebab was super smooth. It melted in my mouth. This created an explosion of the finest Indian flavors while I chewed the kebab lost in a pleasant reverie. 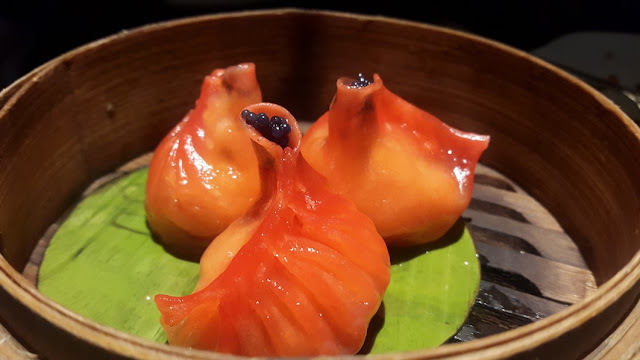 It had mild sourness emanating from green mangoes stuffed in, subtle sweetness from the Yam, savory salty flavor from the cheese stuffing and a pleasant fragrance from the Ginger. It was not spicy and the chili on the top was merely for aesthetic purposes. This kebab was easy on the mouth as one doesn't even need to chew it - It just melts away. This was an amazing experience even for a carnivore like myself. I have been to many fine dines which have unsuccessfully tried to make Prawn Kebabs or at best have attained mediocre results. Chef Farooqui however has whipped up one of the most delectable Prawn creations that I have ever eaten - Lagan Ke Jhinge or Prawns cooked in a Lagan pot. The meat felt completely different from prawns used in a western dish. The gravy had completely blended with the prawn's natural flavor to result into something unique and different from the flavors of either ingredient. The aroma was appetizing and the jumbo prawns were juicy, oozing out flavor with every bite. One could feel as if this food was made with both professionalism and passion. If you love seafood, then this is an item not to be missed. The tails have been removed so it makes the experience more comforting. These four are portions from the mains. Murgh Tilayee at the front is part of the event menu. It was a beautiful creation made of chicken thigh cooked in its own juices and given a finish with vark. This was tender chicken with just the right flavor. It was neither too mild nor too spicy. Juicy, savory and it made the heart warm with happiness. That also counts as internal heat I guess. To its left is Burani Gosht, an extremely flavorful and moderately spicy dish. This mutton based dish is one of the restaurant's best sellers and all for good reason. The flavor is very addicting and the aroma very enticing. The usage of yogurt makes the flavor smooth on the tongue. The green colored dish at the top is Hari Mirch Gosht. Its lamb cooked in a marinade of green chili. This one was very spicy and very rough. Its recommended for those who love to turn up the heat in their food. 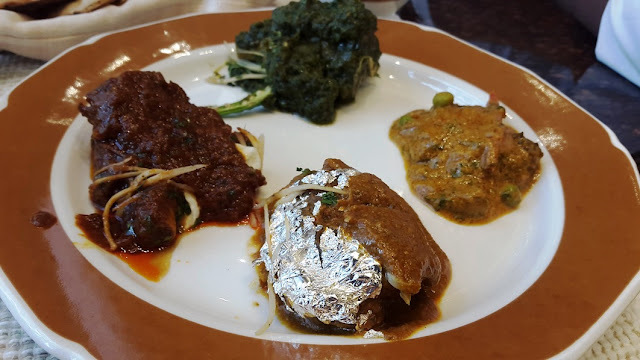 The small portion at the right is Guchidara Murg - It was a wonderful fusion of chicken and morel mushrooms. The flavor was a mix of slightly sour from the mushrooms, savory and salty. Its another one of those things that one won't find anywhere else. This was the creamiest Kulfi that I have ever had. And I am not kidding. It was far better than any ice cream I have had. 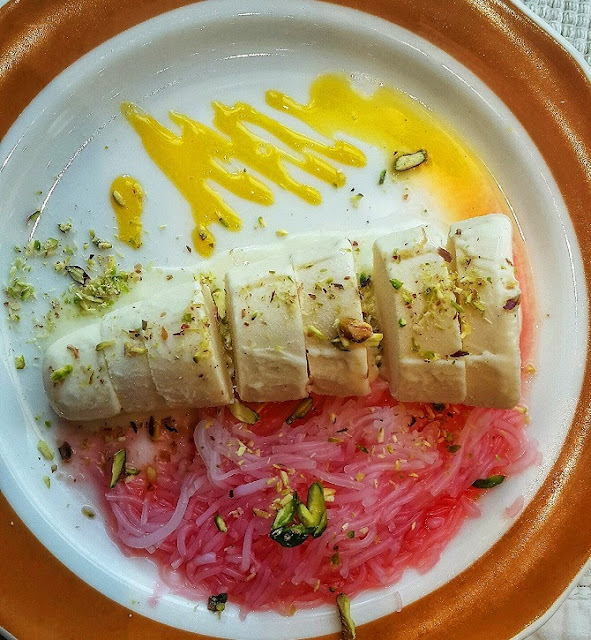 This malai Kulfi felt very much like a cream caramel flavored ice cream, except that its creaminess was legendary. It was served with a bit of Rose falooda(dessert noodles) and sweet saffron syrup. I preferred to eat the Kulfi on its own as its flavor was amazing. The service at K&K is one of the best that I have seen. The people are well trained and know the menu well. Its another one of those small luxuries of eating in a restaurant inside a famous five star Hotel. The service quality was exceptional. The Pricing is on the higher side. 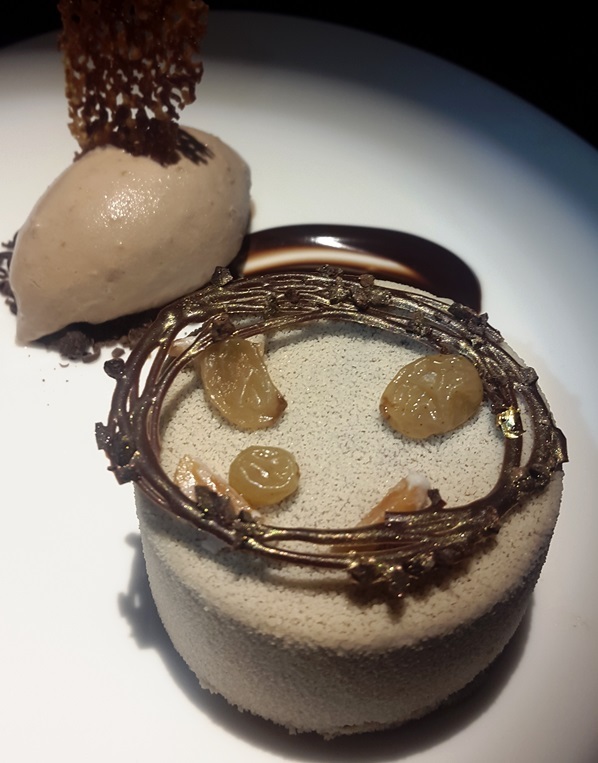 Its expected since the restaurant is inside a five star and the food is made from the best of ingredients by the best of chefs. I'd say its money well spent. K&K is one of the best places for North Indian food in Mumbai. 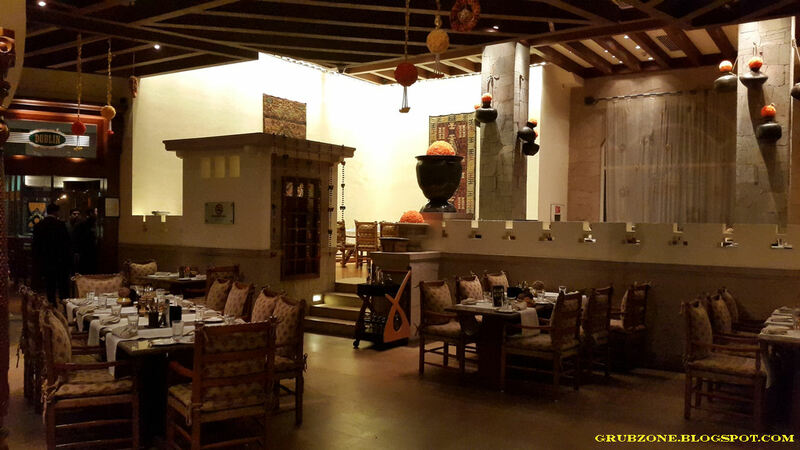 And it specializes in the Awadhi or the Oudh cuisine making it an important place on any food connoisseur's map. The regular menu itself is amazing and the special event menus simply enrich the experience even more. 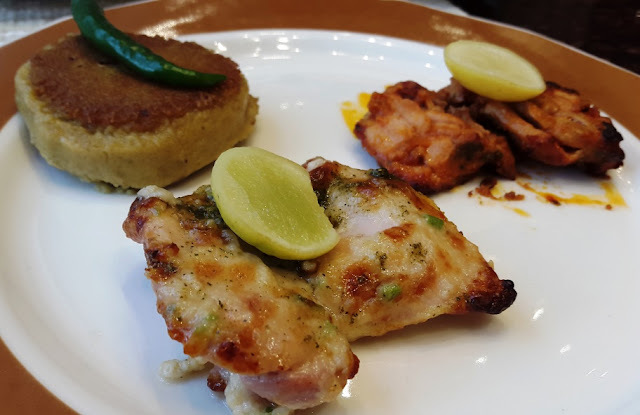 If you love Indian food, then a visit to K&K at the ITC Grand Central in Mumbai is an absolute must. Yauatcha derived from the Chinese words Yum Cha(meaning tea and Dim sum house) is a classy fine dine that is popular for its dim sums(or the most famous of Chinese dumplings). Though it does have other things on its menu, the place is best visited for dim sums. This isn't my first post on Yauatcha as I had been here for a festival last year. I thus won't be covering ambiance or service in this post as those have remained exactly the same as the previous time. So let me pull a Dan Brown here and jump straight to the action, The Food. I was here for a Blogger's meet to sample some of the newest additions to their menu. A communal table blogger's meet often ends up with things being disproportionately divided between bloggers. So I will write about things I was able to sample properly. Fried Turnip Cakes were dry in texture and quite savory. The flavor felt very similar to savory cakes that I have had in India. 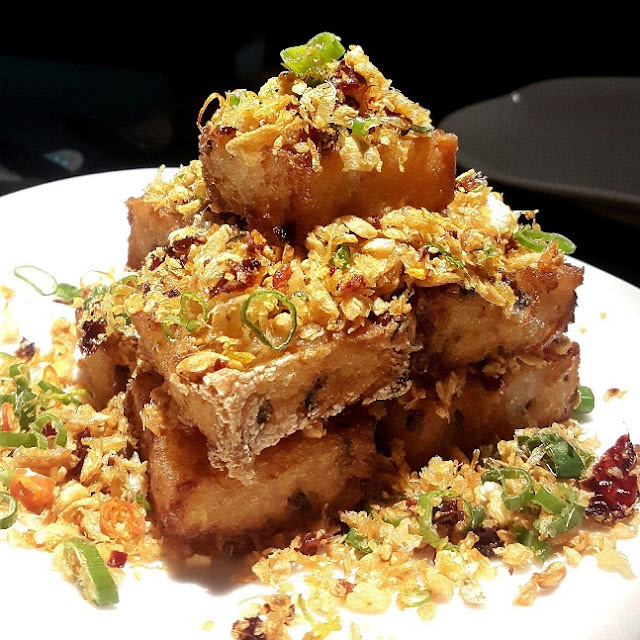 The appearance was an accurate rendition of Turnip cakes eaten in East Asia and abroad. This was my first experience with these and all I can say is that I thoroughly enjoyed these. There was somehow a familiar feel to the flavor. Vegetarians would love these savoury cakes. 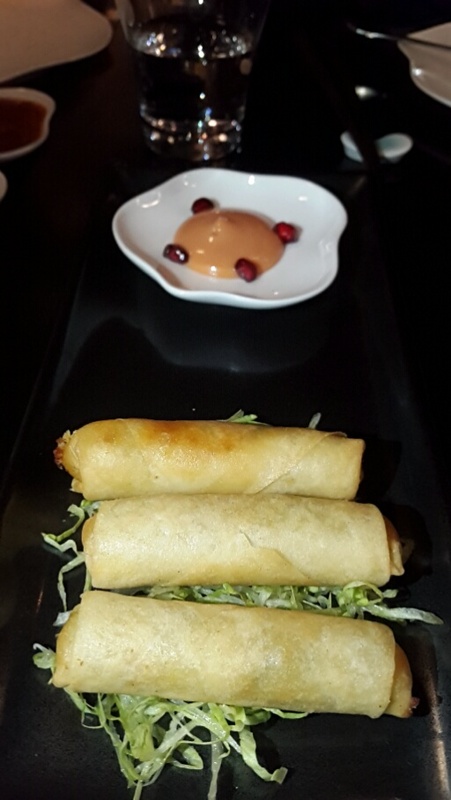 Crispy Asparagus rolls had a subtle savoury flavor of corn and a pleasant asparagus undertone. There were hints of spices but otherwise this was a very gentle on the tongue dish. This would complement well with various Chinese teas like Jasmine tea. In essence, these rolls with piping hot tea capture the true spirit of a yum cha. Spicy Hargau dim sums were pretty little things that were gently spicy and had an earthy feel to them. Another treat for the vegetarians though I felt that more effort was put behind the optics than required. Nonetheless, this was a unique experience. There are a few places in Mumbai that serve Hargau and I would definitely vouch for Yauatcha’s experience. Crunchy Iceberg dumplings topped in terms of optics but the flavor felt a bit on the flatter side. The dim sum was not crunchy enough for its name. The thing that worked for this dumpling however was its rural flavor. One could feel as if this was food from the refreshing countryside. Spicy Pork Sichuan Wontons - These were very delicious and one of the highlights of the menu. This item is popular in the Yauatchas abroad and I am glad that this finally made it into India. 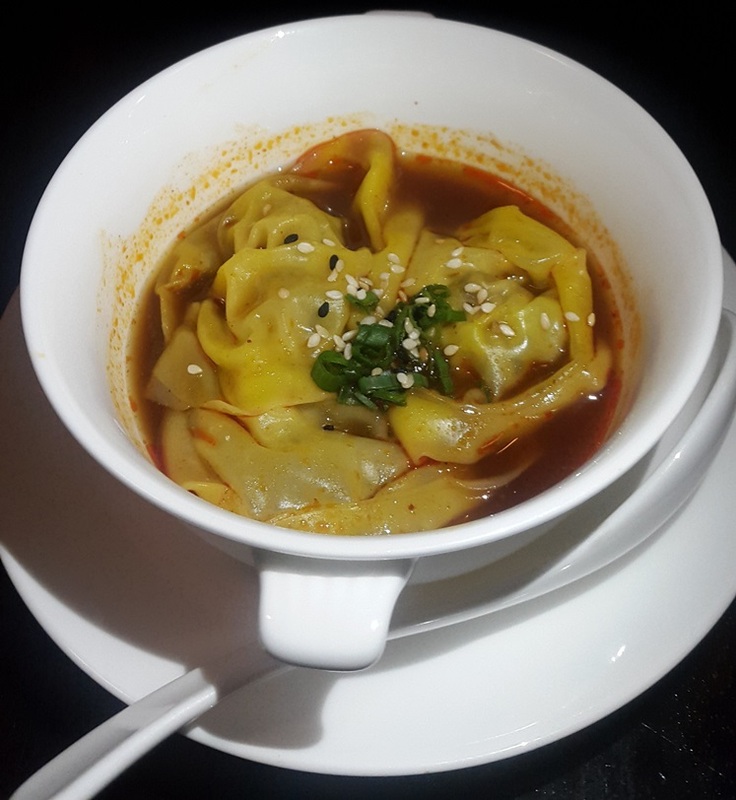 Served in a traditional bowl, the wontons were submerged in a savory soup. This is the correct way of having wontons though we were used to having dry fried wontons in India. The flavor was a mix of savory, sour and salty. There was an undertone of peanut and these dumplings were easy on the palate. Contrary to its naming, I felt no spiciness in this. Crispy Prawn Dumplings were my favorite of the night. These rather simple looking rolls were packed with an amazing flavor. 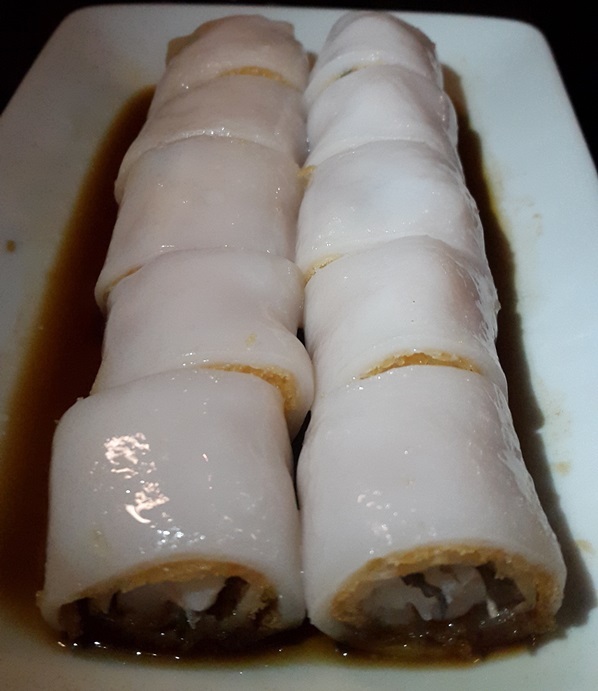 The rolls were made out of bean curd sheets which gave them the smooth velvety appearance. The flavor was savory with minced prawn filling most of the roll. It was slightly crunchy as one chewed past the bean curd. There was a creamy flavor to it as well. I think these rolls really pampered my taste buds. 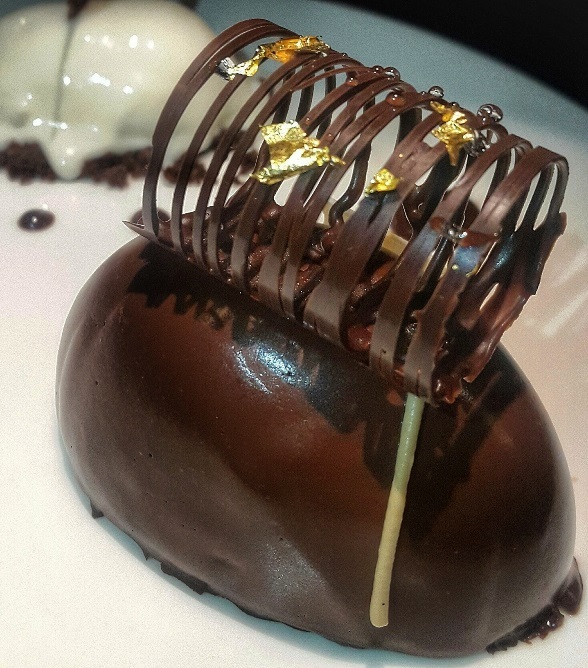 Yauatcha is well known for its artistic desserts made in the patisserie below the restaurant. 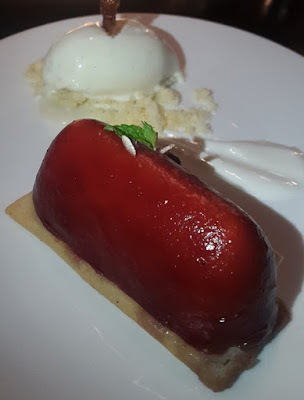 Though I was not able to sample all of these as tossing unguarded desserts in the midst of certain food bloggers is often akin to tossing a piece of meat in between a bunch of hungry wolves ha. Pear and Almond Tart was a fruity end to the meal. This colorful dessert had pear and kiwi in the top layer while almond meal dominated the lower layer inside the crust. I do feel like coming to Yauatcha separately for the desserts someday. The pricing at Yauatcha is definitely on the higher side though it does do good business which speaks in favor of the food and quality served here. The new menu seemed to have more hits than misses for me. What impressed me the most was the fact that the chefs were rigorously trained to produce near exact versions of those produced by Traditional chefs in China. Do note that I am not using the terms "emulation" or "replica" here. 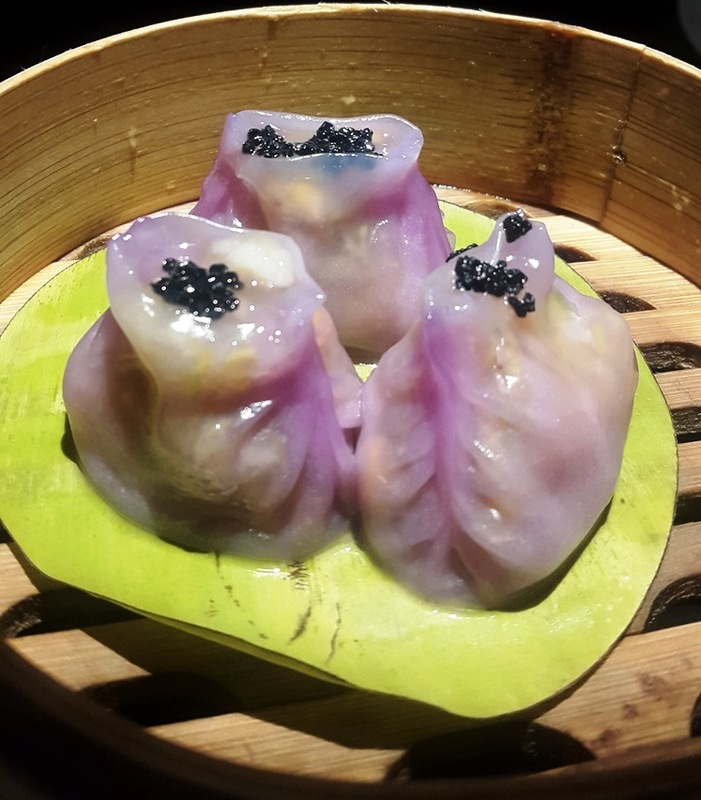 Yauatcha is a little bit of China in India. 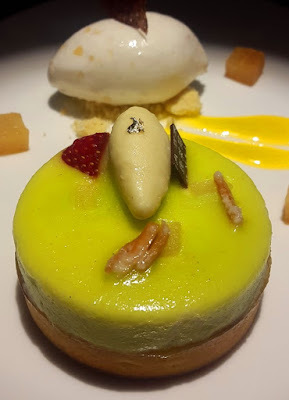 In a posh office district dominated by high quality niche eateries, Yauatcha does stand out high and ranks among the best, I would definitely visit the place again though not part of any group ha.